Originally published in 1976, this title looks closely at the current nature of controls in hypnosis research at the time and tries to assess what they contributed to our knowledge of hypnosis. 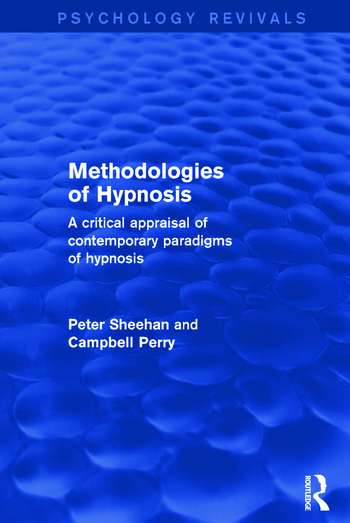 Specifically, the book analyses the contributions to our understanding of hypnotic phenomena offered by the application of six contemporary methodologies, or paradigms, of hypnosis. The primary concern is with those paradigms that are experimental, rather than clinical, in orientation, and which had emerged over the previous decade as coherent programmatic collections of procedural strategies, all of them associated with distinct and important views of how hypnotic behaviour can best be explained. Preface. 1. Historical Antecedents and Perspectives 2. Hypnosis as an Altered State of Awareness: The Methodology of Ernest R. Hilgard 3. The Operational Approach to Hypnosis: The Model of Theodore X. Barber 4. Hypnosis as Role Enactment: The Model of Theodore R. Sarbin 5. Credulous versus Skeptical Accounts of Hypnotic Phenomena: The Methodology of J. Philip Sutcliffe 6. Real-Simulating Model of Hypnosis: The Methodology of Martin T. Orne 7. The Effects of Hypnotizability, Hypnosis, and Motivation on Hypnotic Behavior: The London–Fuhrer Design 8. Validity of Inference and the Application of Convergent Strategies: The Implications of Cross-Paradigm Check 9. Summary and Conclusions: Current Issues and Guidelines to Practice. References. Author Index. Subject Index.